Humber Teaching NHS Foundation Trust and Hull University Teaching Hospitals NHS Trust are teaming up to ensure people in mental health crisis are supported as much as those facing physical health emergencies this winter. Posters and social media platforms will be used to highlight the different services in the community, saving people the anxiety of travelling to the Emergency Department at Hull Royal Infirmary. From talking therapies to the Crisis Pad in Hull, people facing the spectrum of mental health problems will be able to access contact details for the service which best suits their needs. Posters will also be issued to schools, youth clubs and children’s centres to publicise the services available to young people through Humber’s CAMHS. 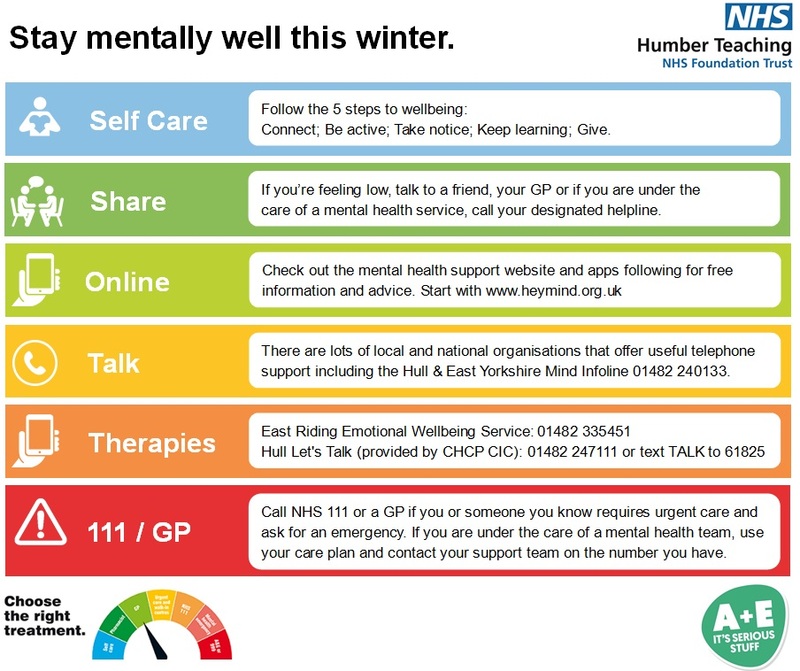 Michele Moran, Chief Executive of Humber Teaching NHS Foundation Trust, said: “Looking after your mental health and wellbeing is important all year round and this year, we have done a lot of work around encouraging people to open up and talk about their feelings. “While this is all well and good, this winter we really want to give people clear guidance on how to nurture their mental health as well as signpost to some of the services available to East Riding and Hull residents. Chris Long, Chief Executive of Hull University Teaching Hospitals NHS Trust, said: “While the festive season is a special time for many, it can also be a difficult time for others and we need to make sure people in distress can access the right services at the right time. “We work very closely with Humber that support is there for people in communities as well as if they come to hospital. “People who come to A&E with mental health emergencies can will be seen by Mental Health Liaison staff who work round the clock, every day of the week, to help people who might be struggling at this time of year.